JOHANNESBURG — Amid population declines for many wildlife species in Africa, conservationists are sounding alarm bells for the cheetah, the fastest animal on land. An estimated 7,100 cheetahs remain in the wild across Africa and in a small area of Iran, and human encroachment has pushed the wide-ranging predator out of 91 percent of its historic habitat, according to a study published on Monday. Consequently, the cheetah should be defined as "endangered" instead of the less serious "vulnerable" on an official watch list of threatened species worldwide, the study said. "This period is really crunch time for species like cheetah that need these big areas," said Sarah Durant, a cheetah specialist at the Zoological Society of London and the lead author of the report published in the journal Proceedings of the National Academy of Sciences. About 77 percent of cheetah habitats fall outside wildlife reserves and other protected areas, the study said, requiring outreach to governments and villages to promote tolerance for a carnivore that sometimes hunts livestock. Besides habitat loss, cheetahs face attacks from villagers, loss of antelope and other prey that are killed by people for their meat, an illegal trade in cheetah cubs, the trafficking of cheetah skins and the threat of getting hit by speeding vehicles. A cheetah has been recorded running at a speed of 29 meters (95 feet) per second. The species may move more slowly while hunting and it can only maintain top speeds for a few hundred meters. More than half of the world's cheetahs live in southern Africa, including in Namibia and Botswana, which have relatively sparse human populations. Cheetahs have been virtually wiped out in Asia, save for fewer than 50 in Iran, according to the study, whose contributors included the Panthera group and the Wildlife Conservation Society. Durant said there was uncertainty over the 7,100 number, which was based on data from experts in areas where cheetahs live and estimates for other areas. Cheetahs are difficult to find because they move over vast regions, she said. Durant also led a previous assessment of nearly 6,700 cheetahs published last year by the International Union for Conservation of Nature, which keeps a watch list of threatened species. Since then, experts have provided new information and refined counting methods, contrasting with rough estimates in the 10,000-range in recent decades. The cheetah population in Zimbabwe declined from an estimated 1,500 in 1999 to between 150 and 170, according to a survey conducted between 2013 and 2015 by a group called Cheetah Conservation Project Zimbabwe. The group solicited cheetah photographs and reports of sightings from tourists, safari guides and others and interviewed more than 1,000 people, including village heads and cattle managers. 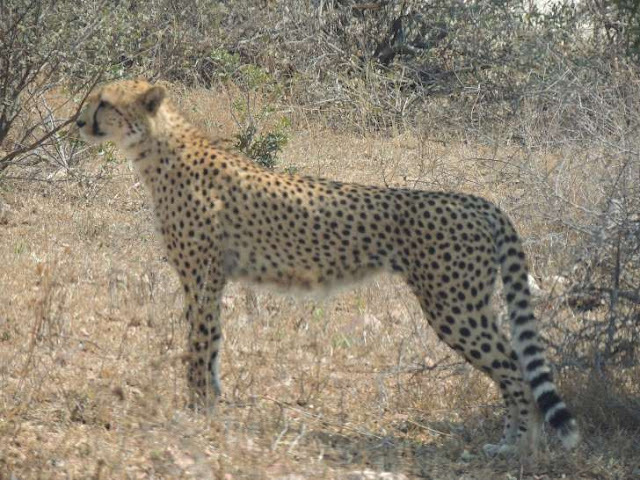 Cheetah experts note that Angola is developing a plan to protect cheetahs and African wild dogs. That could yield better data on cheetah numbers in a country where information has been thin, said Rosemary Groom, a conservationist who participated in an October workshop on the subject in Angola's Quicama National Park. Despite habitat loss across the continent, the Mara area in southwest Kenya and in the adjacent Serengeti National Park in Tanzania still offers a refuge, said Femke Broekhuis, head of the Mara Cheetah Project. Recent data from a GPS collar on one Mara cheetah showed that it traveled 19 kilometers (12 miles) overnight, she said. Cheetahs often roam alone, though on Monday morning Broekhuis saw a rare sight: five male cheetahs, together. The world's fastest land animal, the cheetah, is in danger of extinction because it is running out of space, research led by the Zoological Society of London (ZSL) has found. After a sharp decline in numbers there are now just 7,100 cheetahs in the world, or 9 percent of the historic range, the ZSL, Wildlife Conservation Society and Panthera study found. In Zimbabwe, the study found, these pressures have seen the cheetah population plummet 85 percent from 1,200 to at most 170 animals in just 16 years. Wildlife experts are calling for the big cat to be rated "endangered", up from "vulnerable" among threatened species, to give it greater environmental protection. Capable of sprinting up to 75 miles per hour in short bursts, the cheetah is notoriously secretive and information on its status had been difficult to gather, meaning its predicament had been overlooked, the study said. "Our findings show that the large space requirements for cheetah, coupled with the complex range of threats faced by the species in the wild, mean that it is likely to be much more vulnerable to extinction than was previously thought," said Dr Sarah Durant, who is leading the cheetah conservation programme. The study said that cheetahs were vulnerable to several dangers such as prey loss due to overhunting, habitat loss and illegal trafficking. Added to that, more than three-quarters of cheetahs live outside protected wildlife areas and, because they roam wide, are more vulnerable. Urgent action is needed to stop the cheetah – the world’s fastest land animal – becoming extinct, experts have warned. Scientists estimate that only 7,100 of the fleet-footed cats remain in the wild, occupying 9% of the territory they once lived in. Asiatic populations have been hit the hardest, with fewer than 50 surviving in Iran, according to an investigation led by the Zoological Society of London (ZSL) and Wildlife Conservation Society (WCS). In Zimbabwe, cheetah numbers have plummeted by 85% in little more than a decade. The cheetah’s dramatic decline has prompted calls for the animal’s status to be upgraded from “vulnerable” to “endangered” on the International Union for the Conservation of Nature (IUCN) Red List of threatened species. The cheetah is one of the world’s most wide-ranging carnivores and needs a lot of space. Partly because of this, 77% of its remaining habitat falls outside protected areas, leaving the animal especially vulnerable to human impacts. Even within well-managed parks and reserves the cats have suffered as a result of humans hunting their prey, habitat loss, illegal trafficking of cheetah parts, and the exotic pet trade, say the researchers writing in the journal Proceedings of the National Academy of Sciences. In Zimbabwe, these pressures have seen the cheetah population plunge from 1,200 to a maximum of only 170 animals in 16 years, a decline of 85%. The experts want a new approach to cheetah conservation focusing on the landscape that transcends national borders and incorporates coordinated regional strategies. It would involve motivating both governments and local communities to protect the animal and promoting the sustainable co-existence of humans and wildlife. 0 Response to "Cheetah numbers decline as African habitat shrinks"